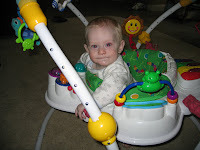 Today Mason tried out his new bouncy seat. He loves it! It has so many toys attached to it he doesn't know which one to look at! 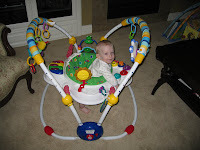 It plays 4 different tunes, makes all kinds of fun sounds, has several dangling toys and rings, and 2 mirrors, in case he forgets what he looks like. Madeline has been giving him lessons on which toys are the best to play with and which song he ought to play over and over...and over. I love the colors in the boys and their toys....bright, bright and brighter the better! He is so cute in his toy!